The bald eagle and Statue of Liberty are among the most iconic American symbols. The Founding Fathers selected the eagle as the national emblem in 1792 for its many strong characteristics. The Statue of Liberty has stood in New York Harbor since the 1880s, welcoming immigrants to American shores and offering a beacon to the rest of the world. 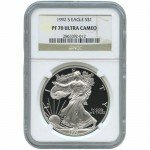 Now, you can purchase a 2012-S 1 oz Silver American Eagle from Silver.com with a PR70 grade from the Professional Coin Grading Service. Comes in an Deep Cameo finish. Special 75th Anniversary edition coin. Congress authorized the Silver American Eagle coin program with passage of the Liberty Coin Act of 1985. 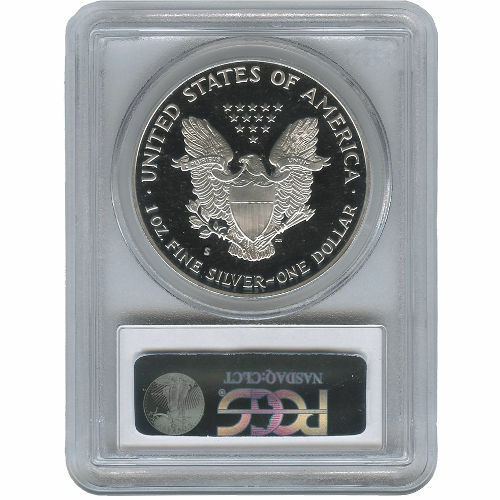 Silver stores from the Defense National Stockpile were used to mint the original coins in the series. An extension was authorized by Congress in 2002 that paved the way for the continued production of the coins, and allowed the Treasury Department to purchase additional silvers stores. These 2012-S 1 oz Silver American Eagle coins have a PR70 grade from the PCGS. PR70 means the coins were perfectly struck by the Mint. A DCAM designation indicates a proof coin with a strong, frosted design set against a deeply mirrored, clear field in the background. An “S” mint mark signifies the coin was produced at the San Francisco branch of the US Mint. On the obverse of the coin is the Walking Liberty design from Adolph A. Weinman. First used on the Walking Liberty Half Dollar in the early 20th century, Lady Liberty is featured walking toward the setting sun. Engravings include “Liberty,” “In God We Trust,” and the year of minting. The reverse bears John Mercanti’s heraldic eagle, designed by the US Mint’s chief engraver specifically for this coin. In the image, an eagle sits behind a shield with arrows in one talon and an olive branch in the other. Thirteen stars above the eagle’s head represent America’s original colonies. Engravings include “United States of America,” the weight, purity, metal content, and face value of the coin, as well as the “S” mint mark. If you have any questions about the 2012-S 1 oz Silver American Eagles PCGS PR70 DCAM or other Silver.com products, call our associates at 888-989-7223. Feel free to also contact us on the web using the live web chat feature located on our contact page.